MedArt ILVO diode laser provided different options of doing treatment with 600 micron optical fiber together with a guide wire introducer sheath and needle for percutaneous perforation. Prior to treatment the SFJ and GSV are mapped through use of color duplex ultrasound. The guide wire introducer sheath is introduced into the GSV – at level with the knee or the lower part of the thigh. The fiber is advanced via the introducer sheath until the fiber tip is positioned 1-2cm distal to the SFJ. A red guiding light emitted from the fiber tip provides a helpful indication of the tip position. Prior to release of the laser beam, the exact tip position is controlled carefully by use of ultrasound. The method has been well tolerated by the majority of the patients treated, with only occasional feelings of heat during treatment. Most patients show mild ecchymosis and occasional mild induration and paresthesia in the area of anesthetic infiltration. It is expected that the undesired side-effect incidence will decrease as the operators gain more experience in the use of this new technique. The results were evaluated by the physicians as well as patients. 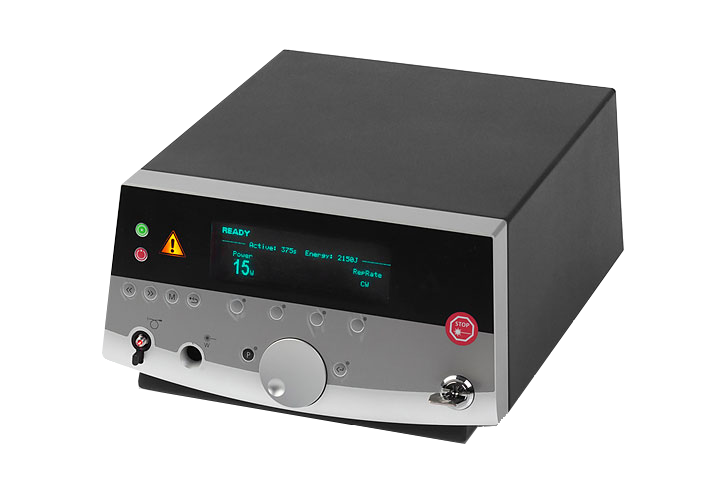 MedArt ILVO system Laser is ergonomically designed in complement two different fiber types of bare fiber and radial fiber with 400 or 600 µm fiber diameter. The ILVO kit also consists of Introducer catheter (14G, 70cm) with guide wire and cannula. 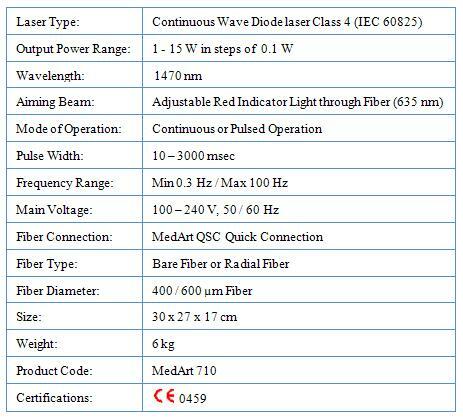 MedArt also created Ouick Safe Connection (QSC) to have a minimal risk of having optical damages of fiber connection.